The polemical isn’t always preachy. Sean McNall as Mr. Valentine is demonstrative with Amelia Pedlow’s Gloria Clandon. 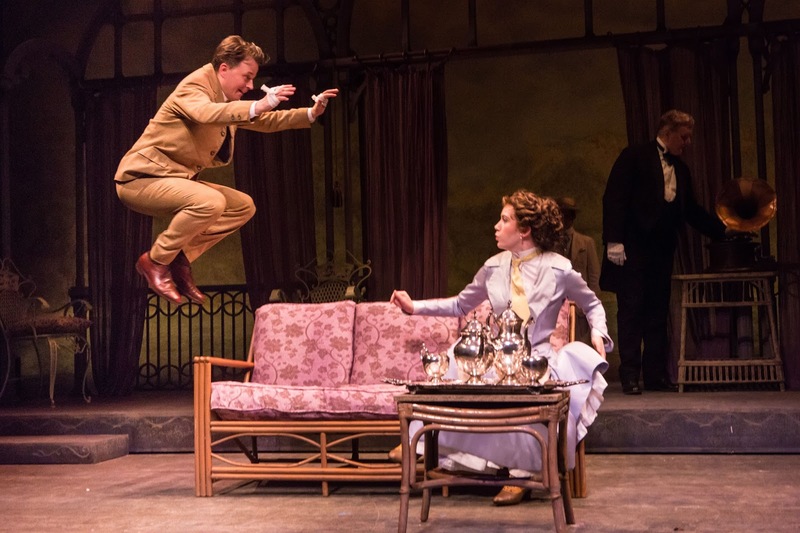 Dan Daily as Walter Boon, the waiter aka William in The Pearl’s production of GSB’s “You Never Can Tell.” Photo by Al Foote III. Sometimes, as in George Bernard Shaw’s “You Never Can Tell,” in a charming production by The Pearl Theatre Company in cooperation with the Gingold Theatrical Group whose Artisitic Director David Staller directs this presentation at the Pearl’s home on W42nd through October 17, it’s keen and cheeky. Sean McNall, Ben Charles, Emma Wisniewski, Zachary Spicer, Dominic Cuskern. Photo by Al Foote III. 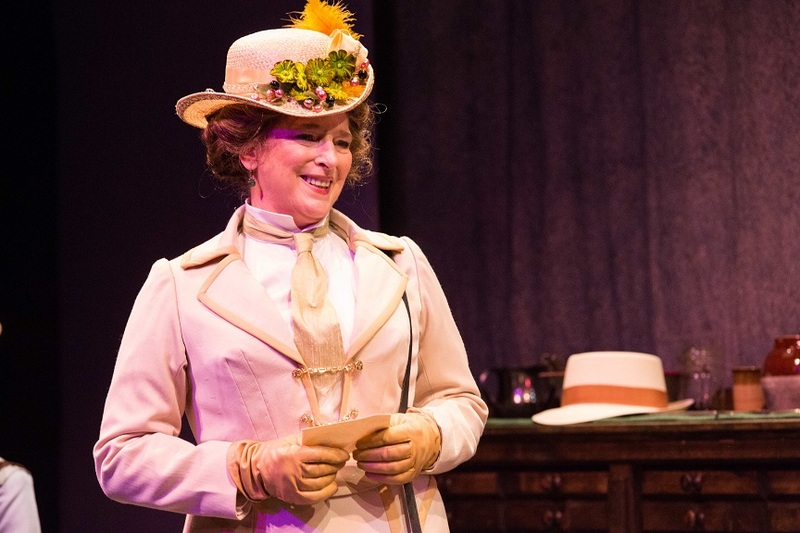 Robin Leslie Brown is Mrs. Margaret Clandon in GSB’s “You Never Can Tell.” Photo by Al Foote III. In “You Never Can Tell,” Mrs. Margaret Clandon (Robin Leslie Brown) returns from an eighteen year exile in Madeira to an English seaside town. 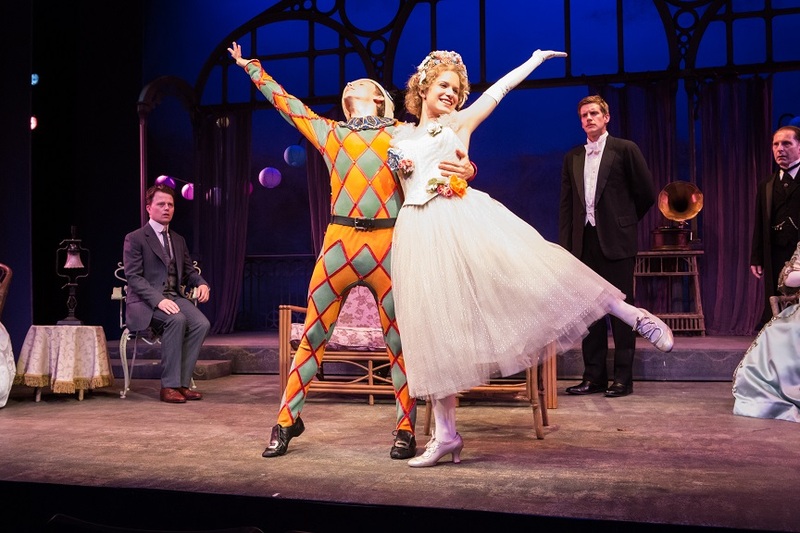 With her are her children Dolly (Emma Wisniewski), Philip (Ben Charles) and Gloria (Amelia Pedlow.) The two younger, Dolly and Ben are untamed and wild. It is an unabashed pleasure to watch newcomer Emma Wisniewski scampering about. Mrs. Clandon earns an esteemable income and some celebrity from a series of books about 20th century manners in which she flaunts convention and espouses liberation for women. She has attained some of that liberation for herself, as she has succeeded in separating from her marriage without actually ending it. 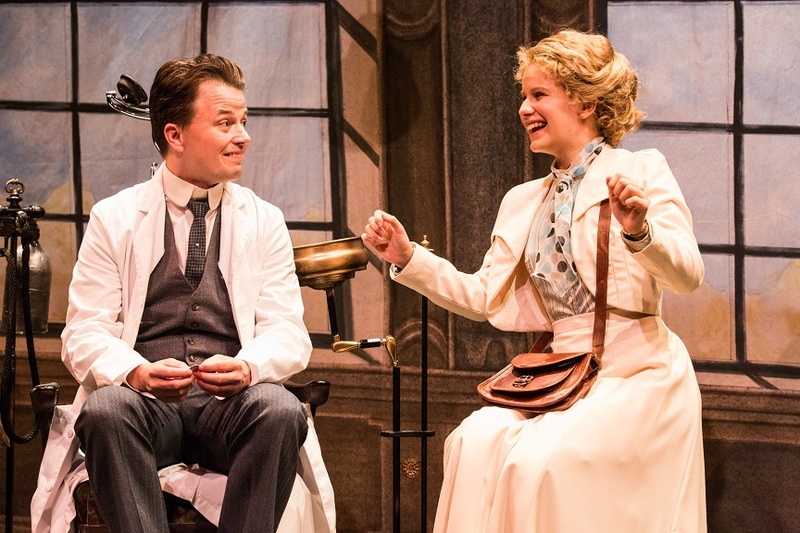 Sean McNall as the dentist Mr. Valentine with Emma Wisniewski as Dolly Clandon in “You Never Can Tell” by George Bernard Shaw. Photo by Al Foote III. 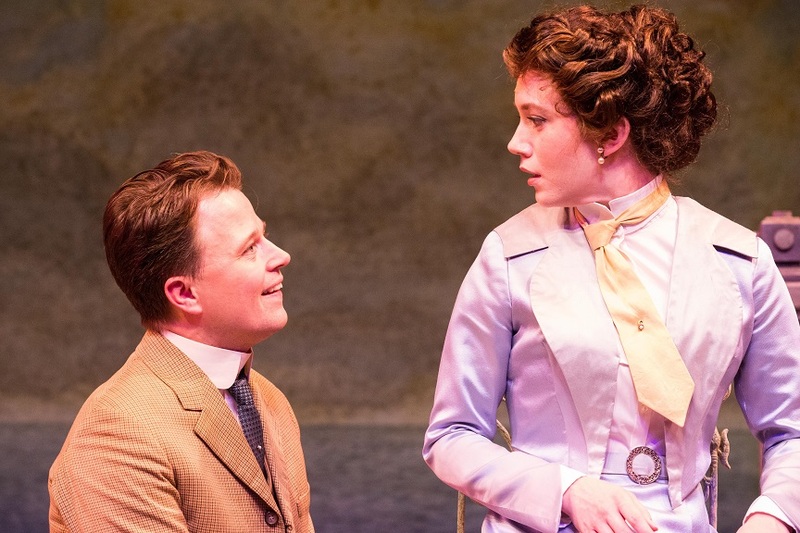 Mr. Valentine (Sean McNall) and Miss Gloria Clandon (Amelia Pedlow). Photo by Al Foote III. Mr. Valentine, reduced to dentistry after several failed attempts at other medical practices, suffers from an excess of levity and a shortage of funds. He is so poor that he is forced to dupe his landlord, Fergus Crampton (Bradford Cover), in order to cover his past rent. The first act of “You Never Can Tell” tends to mystify. But oh, when it all becomes clear in the second act, what a delight. the cast to wear in Harry Feiner’s lovely sets. 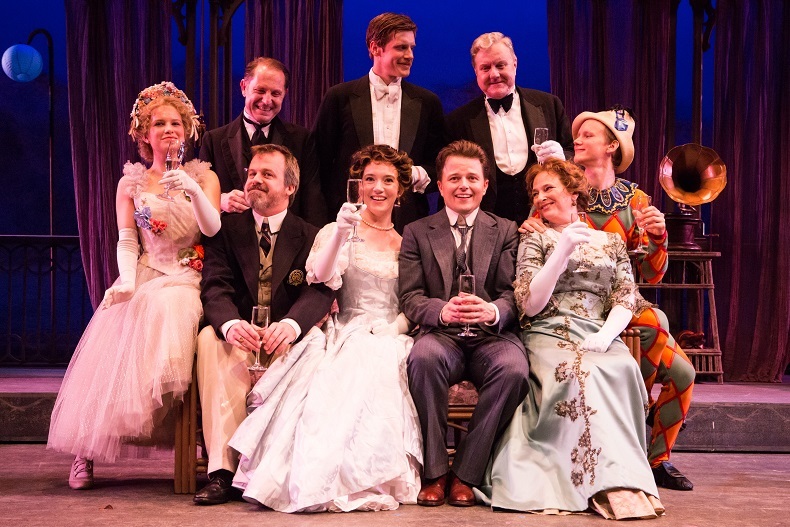 L-to-R, seated Dolly (Emma Wisniewski), Fergus Crampton (Bradford Cover), Gloria (Amelia Pedlow), Mr. Valentine (Sean McNall), Mrs. Margaret Clandon (Robin Leslie Brown), with Philip Clandon (Ben Charles) directly behind her. Standing L-to-R, Finch mcComas (Dominic Cuskern), Walter Bohun (Zachary Spicer), and Walter Boon (Dan Daily). Photo by Al Foote III. “You Never Can Tell” is as sparkling a production as the champagne uncorked for all to sip at the curtain. For more information about “You Never Can Tell,” please visit The Pearl’s website.